With the demise of the E-type in 1974 few people realised that Jaguar would be abandoning the sports car market, for although the company had initially contemplated a direct replacement this was not to be - a situation brought about not so much by Jaguar, as by world opinion. Most other manufacturers were abandoning the principle of an open top two-seater with rakish styling, plenty of noise, a relatively hard ride, and all the other features associated with the true sports car that margues like Jaguar, Triumph, and MG had become famous for. Instead, changing legislation, the need for improved safety - particularly for the US market -and drivers wanting more refinement in an everyday car, forced manufacturers to think of producing coupes and grand touring cars that would cater for a wider audience and, if based on existing saloons, would be cheaper to produce and therefore more profitable. Jaguar had, to some extent, already gone down this route with the Series 3 E-type, in that it was a much more refined car than previous Es. 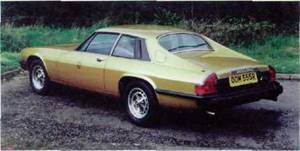 They had also introduced the ill-fated XJ coupe as an alternative to a four-door saloon in 1973, though it didn't actually appear until late in 1974 for 1975 delivery, and was abandoned in 1977, partly due to build problems. This set the scene for the XJ-S or XJ 'sport', utilising the short wheelbase floorpan of the XJ saloon, essentially the same V12 engine and suspension, as well as many other mechanical and trim items, this being considered an economical way forward. Allied to this was Jaguar thinking that it would be best to move up-market with such a two-door coupe, no longer catering for a relatively small sports car audience but instead aiming at another market 'new' to Jaguar and at a much higher price. In fact the XJ-S was geared to be the most expensive production car the company had produced, so it was marketed at owners of Jensen Interceptors, Ferraris, Maseratis, and other well known luxury super-cars. 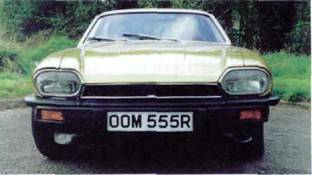 The original XJ-S cars, now known as Pre-HE, are identified by the black rubber bumper bars front and rear. For the first couple of years in production they also featured this matt black boot panel and chromed finisher to the B/C post area. All Pre-HE models had the Kent alloy wheels depicted here. For the exterior design two basic ideas were considered, one coming from Jaguar's in-house styling department, the other from Malcolm Sayer, already well known for his work on the E-type. His design won out and was to be a radical move for Jaguar, virtually abandoning the traditional style and features normally expected from the marque. This had a negative effect on existing customers because the car was nothing like previous Jaguars - no wood veneer inside, hardly any chrome outside, avant-garde exterior styling, and not a Jaguar leaper to be found anywhere! 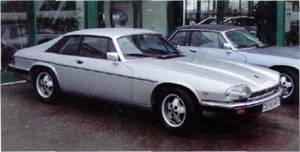 The effect on the 'other' market was also not encouraging; Jaguar's poor 1970s reputation didn't help, and few considered that the XJ-S had the 'street cred' of, say, a Ferrari. Frontal aspect of the Pre-HE XJ-S from 1975 to 1981, with black radiator grille and rubber bumper bars. When launched at £8,900 it certainly wasn't cheap by Jaguar standards and was actually very close in price to competitors like the Mercedes Stand Porsche 911; and although faster than most, extreme thirst for fuel and worries over longevity proved deadly for the new car. Sales seemed reasonably encouraging for the first couple of years, but they soon started to decline, to the point where the Board at Jaguar considered dropping the whole project. This may have happened had it not been for the foresight of the new man at the helm, John Egan. By 1981 the XJ-S had been revitalised with a more economical engine, improvements in build quality, and the restoration of some semblance of traditionalism. Sales started to rise, helped in addition by race track success in the US initially, and later in Europe courtesy of the TWR team competing in the European Touring Car Championship. In 1984 TWR won the championship and drivers' championship outright from BMW, and the popularity of the XJ-S soared. From 1981 the car was called the XJ-S HE, identified from the side by its twin coachlines and starfish alloy wheels. Other models entered the range during the 1980s, offering cheaper alternatives and, with the cabriolet, a return to semi-open top motoring. Pressure from the US resulted in a full convertible, which appeared at the end of 1987 and gave another boost to a car and company that were now in the throes of significantly better times. 1989 proved a record year for XJ-S sales, with over 10,000 being produced. The model was totally rejuvenated in 1991 with a new bodyshell, yet greater improved quality, and a 4.0-litre engine (eventually a 6.0-litre was added as well). Year on year the XJS was improved, and even when the world became aware of a forthcoming entirely new replacement (the XK8) sales were still better than they had been in the 1970s or early 1980s. Comparison frontal view of the three styles of XJ-S and XJS from the 1981HF (centre), to facelift on the right, and Celebration on the left. Despite the XJ-S being considered early on as somewhat of an 'ugly duckling' it went through several revival stages, eventually earning its keep handsomely. Today it is still unique in its styling and is as instantly recognisable as the E-type. Over 115,000 were produced in its 21-year history and even its XK8 replacement is based on the same floorpan. The XJ-S turned out to be a fitting tribute to Jaguar and was perhaps the ultimate refined sporting grand tourer.